The sound of the human voice is produced due to vibrations in the vocal cords. It can be solid, liquid or gas. When an object vibrates, it sets the particles of the medium around it vibrating. A wave is a disturbance that moves through a medium when the particles of the medium set neighboring particles into motion. This is what happens during propagation of sound in a medium; hence sound can be visualized as a wave. Sound waves are characterized by the motion of particles in the medium and are called mechanical waves. 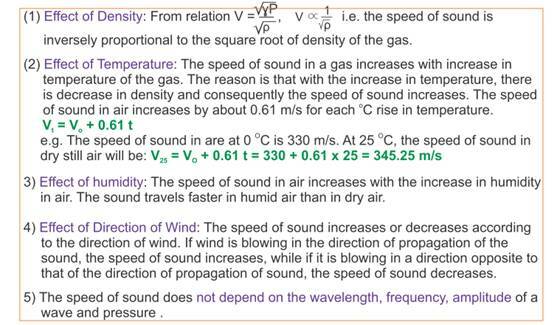 Air is the most common medium through which sound travels. When a vibrating object moves forward, it pushes and compresses the air in front of it creating a region of high pressure. This region is called a compression(C). When the vibrating object moves backwards, it creates a region of low pressure called rarefaction (R). Sound is a mechanical wave and needs a material medium like air, water, steel etc. for its propagation. It cannot travel through vacuum. We can compare the propagation of disturbance in a slinky with the sound propagation in the medium. These waves are called longitudinal waves. In these waves the individual particles of the medium move in a direction parallel to the direction of propagation of the disturbance. In a transverse wave particles do not oscillate along the line of wave propagation but oscillate up and down about their mean position as the wave travels. A transverse wave is the one in which the individual particles of the medium move about their mean positions in a direction perpendicular to the direction of wave propagation. The density as well as the pressure of the medium at a given time varies with distance, above and below the average value of density and pressure. Compressions are the regions where particles are crowded together and represented by the upper portion of the curve. The peak represents the region of maximum compression. 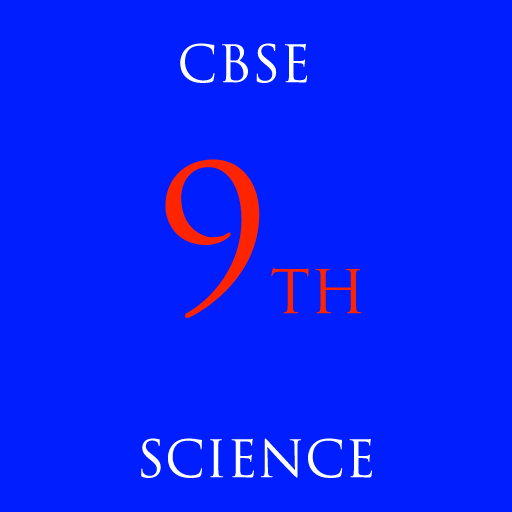 The distance between two consecutive compressions (C) or two consecutive rarefactions (R) is called the wavelength. The wavelength is usually represented by λ(Greek letter lambda). Its SI unit is meter (m). The change in density from the maximum value to the minimum value, again to the maximum value, makes one complete oscillation. 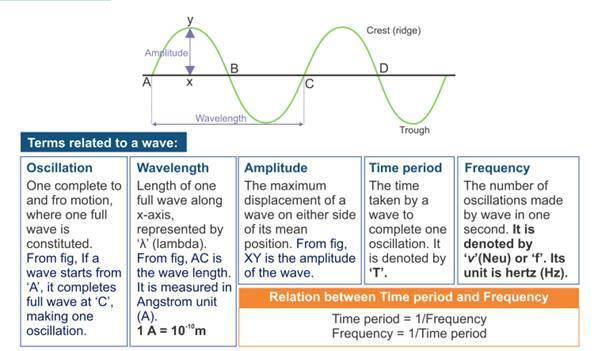 The number of such oscillations per unit time is the frequency of the sound wave. If we can count the number of the compressions or rarefactions that cross us per unit time, we will get the frequency of the sound wave. It is usually represented by ν (Greek letter, nu). Its SI unit is hertz (symbol, Hz). The time taken by two consecutive compressions or rarefactions to cross a fixed point is called the time period of the wave. It is represented by the symbol T.
How the brain interprets the frequency of an emitted sound is called its pitch. A high pitch sound corresponds to more number of compressions and rarefactions passing a fixed point per unit time. The magnitude of the maximum disturbance in the medium on either side of the mean value is called the amplitude of the wave. It is usually represented by the letter A. 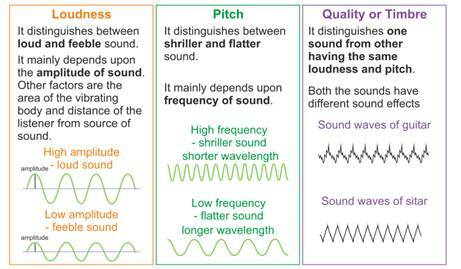 The loudness or softness of a sound is determined basically by its amplitude. The amplitude of the sound wave depends upon the force with which an object is made to vibrate. When a sound, producing source moves with a speed higher than that of sound, it produces shock waves in air. These shock waves carry a large amount of energy. The air pressure variation associated with this type of shock waves produces a very sharp and loud sound called the “sonic boom”. Sound bounces off a solid or a liquid like a rubber ball bounces off a wall. Like light, sound gets reflected at the surface of a solid or liquid and follows the same laws of reflection. The directions in which the sound is incident and is reflected make equal angles with the normal to the reflecting surface at the point of incidence, and the three are in the same plane. An obstacle of large size which may be polished or rough is needed for the reflection of sound waves. If we shout or clap near a suitable reflecting object such as a tall building or a mountain, we will hear the same sound again a little later. This sound which we hear is called an echo. For hearing distinct echoes, the minimum distance of the obstacle from the source of sound must be half of this distance. Echoes may be heard more than once due to successive or multiple reflections. The audible range of sound for human beings extends from about 20 Hz to 20000 Hz. People with hearing loss may need a hearing aid. A hearing aid is an electronic, battery operated device. Ultrasounds are high frequency waves. Ultrasounds are able to travel along well defined paths even in the presence of obstacles used extensively in industries, for medical purposes, used to clean parts located in hard-to-reach places, to detect cracks and flaws in metal blocks. Ultrasonic waves are allowed to pass through the metal block and detectors are used to detect the transmitted waves. Ultrasonic waves are made to reflect from various parts of the heart and form the image of the heart. This technique is called ‘echocardiography’. 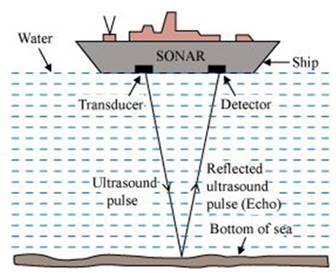 The acronym SONAR stands for Sound Navigation And Ranging. These waves travel through water and after striking the object on the seabed, get reflected back and are sensed by the detector. The detector converts the ultrasonic waves into electrical signals which are appropriately interpreted. 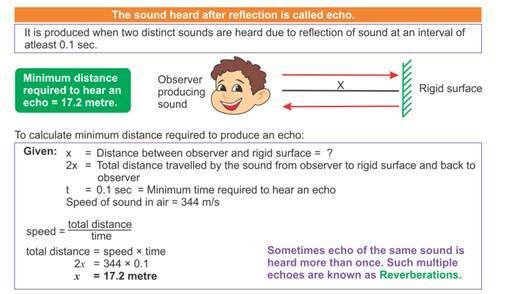 The distance of the object that reflects the sound wave can be calculated by knowing the speed of sound in water and the time interval between transmission and reception of the ultrasound. We are able to hear with the help of an extremely sensitive device called the ear. It allows us to convert pressure variations in air with audible frequencies into electric signals that travel to the brain via the auditory nerve. The outer ear is called ‘pinna’. It collects the sound from the surroundings. The collected sound passes through the auditory canal. 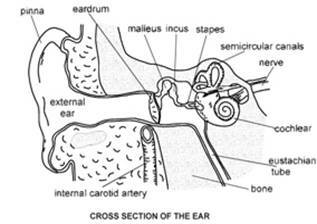 At the end of the auditory canal there is a thin membrane called the ear drum or tympanic membrane. When a compression of the medium reaches the eardrum the pressure on the outside of the membrane increases and forces the eardrum inward. Similarly, the eardrum moves outward when a rarefaction reaches it. In this way the eardrum vibrates. The vibrations are amplified several times by three bones the hammer, anvil and stirrup in the middle ear. The middle ear transmits the amplified pressure variations received from the sound wave to the inner ear. In the inner ear, the pressure variations are turned into electrical signals by the cochlea. These electrical signals are sent to the brain via the auditory nerve, and the brain interprets them as sound.